She was born on a cold dark middle-of-the-winter day, February 25, 1940 at home on Cedar Street in Ogdensburg, New York. She was a beautiful child with blue eyes and silvery blonde hair, born as the second daughter and eighth child to a family that scraped by from day to day. Always a happy girl, there was ever a smile or a tinkle of laughter escaping her pouty little lips. 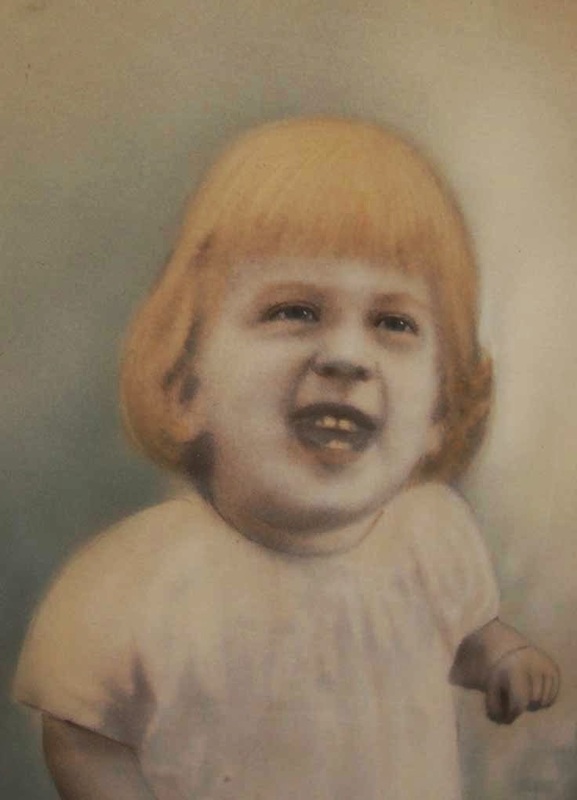 She was a year and eight months old when her family moved to a new home on a farm October 31, 1941. Little did anyone remotely guess that in a mere 37 days our country would be drawn into a European war by the dastardly sneak attack on the Naval Base at Pearl Harbor, Hawaii, December 7th, ordered by the Japanese Government against a neutral nation. Less than a month later, on January 2, 1942 the less than two-year-old Dixie would burn to death in a horrible accident. She was laid in the ground in the Ogdensburgh Cemetery for her final nap, and remains there today. Her mother toyed with the idea at one time of having her exhumed and reburied by her side in the Flackville Cemetery, but decided she was best off in her original resting place, not to be disturbed. For as long as I live I shall occasionally stop for a short visit with Dixie. I don’t think anyone else remains that ever saw her, or knew her. When I, her last remaining older sibling am gone, who will weep for the child that had no chance to live her life? Who will visit Dixie? In the middle of our training one week was dedicated to Service Week. Most Companies were involved in food preparation in some manner. Some peeled potatoes, some helped cooks, some served on the serving line, while some washed dishes in the scullery. Our Company, for whatever reason (luck I guess), was selected to do service other than that. 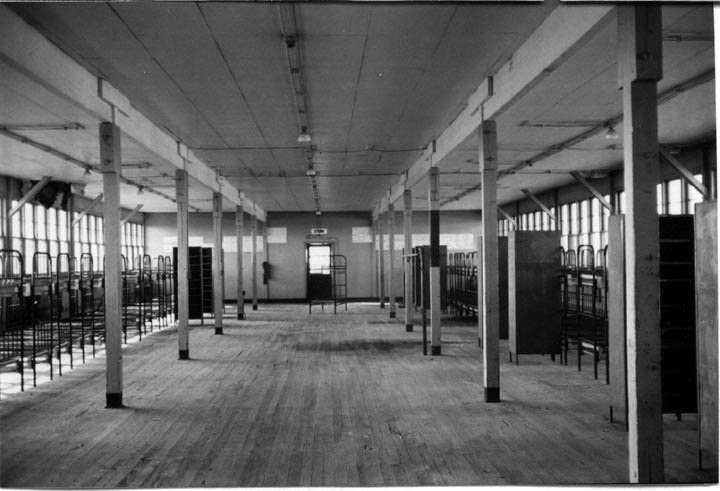 Many were selected to be cleaners in various training buildings, and other such tasks. I’ve no knowledge as to why I was selected, but for whatever reason I got the enviable/unenviable job of cleaning the Recruit Training Commanding Officer’s office. He was Captain William J. Catlett, Jr., and as far as I was concerned he was right up there somewhere around God in rank. My job was to arise at 0300, go to the galley for early breakfast, and be in the Captain’s office by 0400 to begin my day’s work. He had an inner office and an anteroom. The inner office was rather Spartan with solid oak desk, and solid, no nonsense chairs here and there, while the outer room was a much softer décor with leather covered sofa and chairs. Daily I dusted everything in sight, washed everything I didn’t dust, vacuumed most of the rest, and rearranged what little might be out of place, which was next to nothing. When Captain Catlett arrived around 0800 I was to be as unobtrusive as possible while remaining in the outer office in case I was needed until he left for the day around 1600 – 1700. After that I returned to my barracks. About the third or fourth day of this I cleaned as usual. When I had everything shipshape I worked up courage enough to sit down on the huge overstuffed leather-covered sofa. I awoke with Captain Catlett gently shaking my shoulder. I jumped to attention, trying to salute, say good morning, and apologize, all at the same time. He merely told me to carry on, and entered his office. In the middle of that afternoon he summoned me into his office. I had heard of Captain’s Mast punishment, and dreaded my summons, but I dutifully entered. Trembling, I answered, “I like it.” Was I to tell him what I really thought? I began to see the light. This was the first time in many weeks that anyone had treated me with any reasonable respect, and he actually was looking for my opinion which could somehow affect what everyone in this training facility was doing. For about a half hour I gave my opinion on a variety of topics all having to do with the recruit training program. It is doubtful that anything I said was valued enough to cause any action to be taken, but at least I discovered even a lowly recruit could possibly have some effect on higher decisions. Nearly 60 years later I recall one of his questions was what I wanted to do with my time in the Navy. I answered that I was happy just cleaning his office, and I would do that for my entire enlistment if it was okay with him. He told me that there was much more, and better things for me in store, and don’t settle for any less than the best I could do. He then dismissed me, and my indiscretion of sleeping on the job was never mentioned. While at Bainbridge all recruits marched nearly everywhere. We marched to chow three times a day, and we marched back to our barracks, or wherever. We marched to each separate building for classes in seamanship, leadership, fire training, etc. Everyone was issued a weapon also which was carried everywhere while marching. In case that wasn’t enough we also practiced marching on the “grinder,” a ¼ mile square of asphalt. About two weeks into our training our Company Commander asked for volunteers for Color Guard. Although I was fast learning to never volunteer for anything I did volunteer for this. I had seen the Color Guard practicing. They marched around with flags doing all sorts of strange tricks with them. Instead of going to marching drills on the grinder every morning, the Color Guard met inside a large drill hall to practice. I turned in my weapon as I no longer needed it. The first day we practiced for an hour. At the end of the hour we were merely dismissed back to our barracks to meet with the remainder of the Company to complete our day of training. The next day I reasoned as long as they didn’t muster us in or out there was little reason for me to remain so I slipped out a side door, returned to our barracks and did some laundry. I repeated this for several weeks. One day as I was entering the drill hall a fellow Color Guardsman slipped and fell ripping out the crotch of his pants. Some authority called him a klutz and dismissed him from Color Guard. As I had learned nothing of the Color Guard, and realized someday I was going to have to perform during a Company graduation ceremony, I needed a way out. The next morning I used a razor blade to slit most of the stitching in the crotch of the pants I was wearing before going to practice. As I entered the building, I managed to fall down, splitting my pants. I was told to leave and not come back. My plan worked well. When I informed my Company Commander what had happened he told me, as I didn’t know the weapon training manual of arms, to remain in the barracks each day. This was even better than good. For the remainder of boot camp I neither was in Color Guard not did I march with my company. Commodore William Bainbridge commanded the United States frigate Constitution when it sank the British frigate HMS Java during the war of 1812. 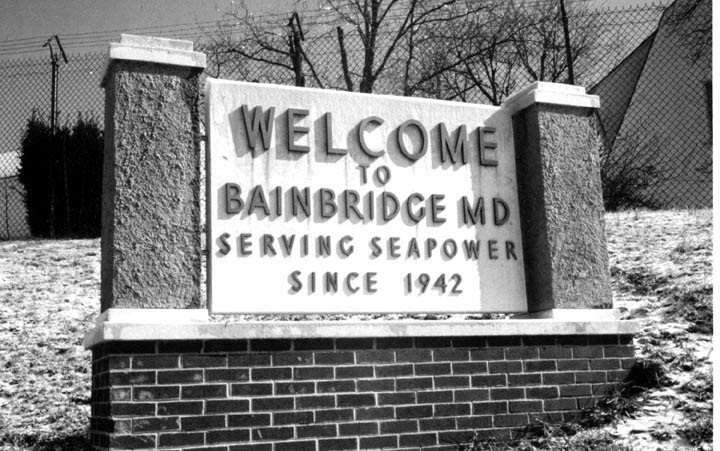 In 1942 President Franklin Delano Roosevelt personally honored Bainbridge by naming the newest recruit training center after him. 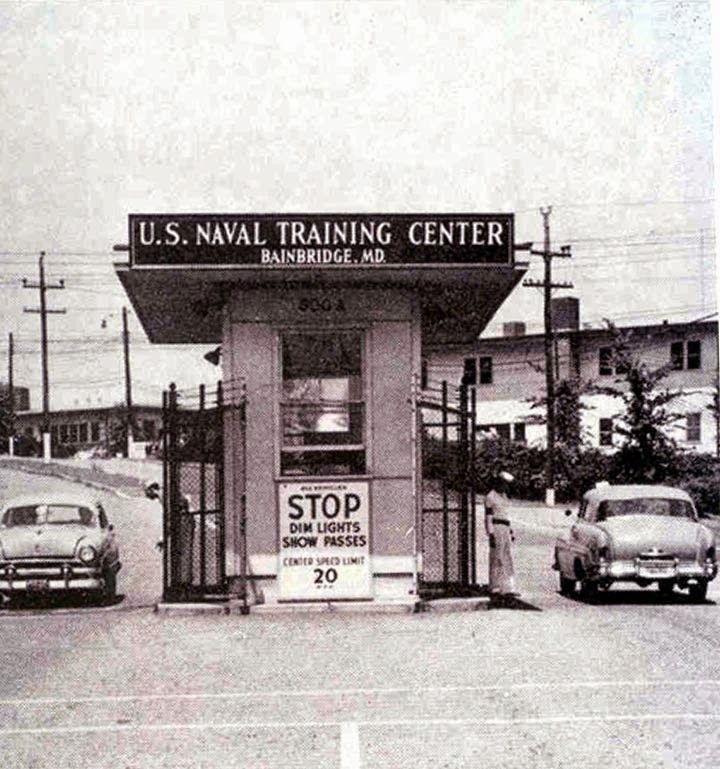 First opened October 1, 1942 for the training of Navy recruits it continued in that status until June 30, 1947 when it was inactivated as a recruit training center. However the Recruit Training Center was reactivated February 1, 1951 as the Korean Conflict began to heat up into a major war. In October 1951 a WAVE (Women Accepted for Voluntary Enlistment) Recruit Training facility was established. 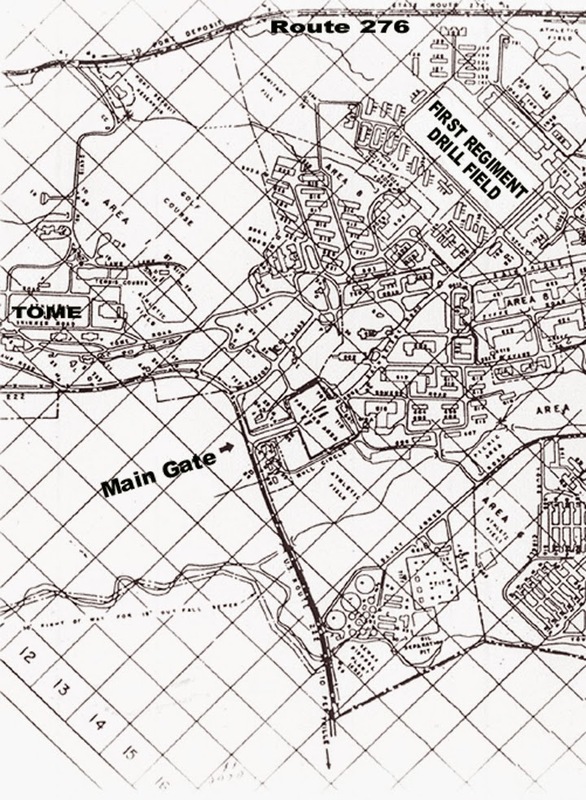 All male recruit training on the site ceased in 1959. 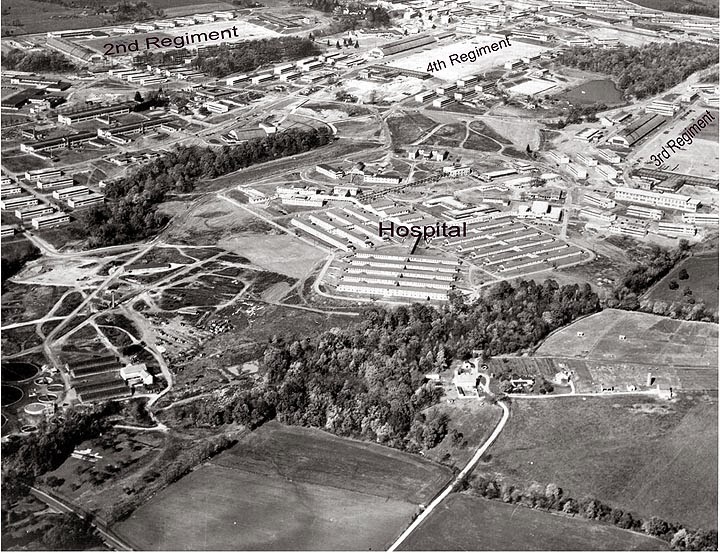 The Recruit Training Facility was once again deactivated as a recruit training center in 1976, and ultimately ceded to the State of Maryland in 1986. September 8, 1955 I entered the gate of Bainbridge, part of a busload of recruits from upstate New York State having been sworn in the previous day in Syracuse. 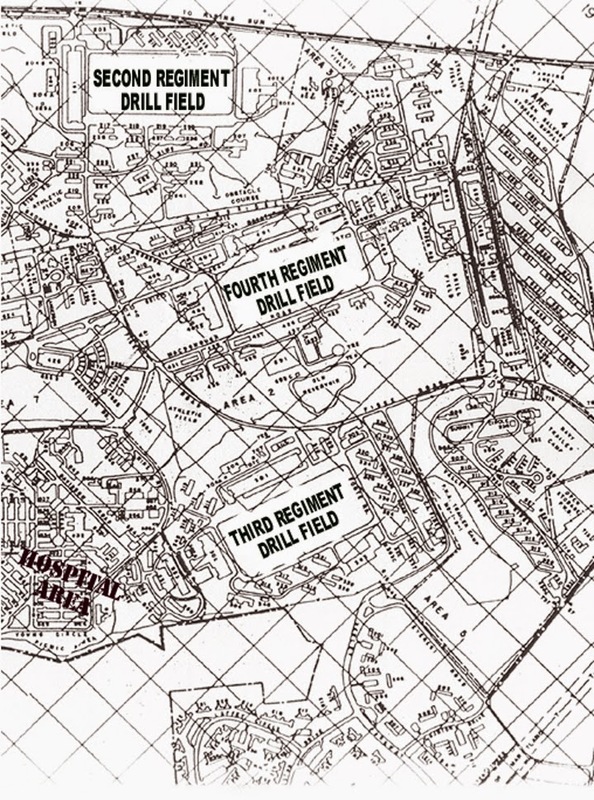 Soon I became one of 56 recruits to be assigned to Company 447, 16th Battalion, 1st Regiment. 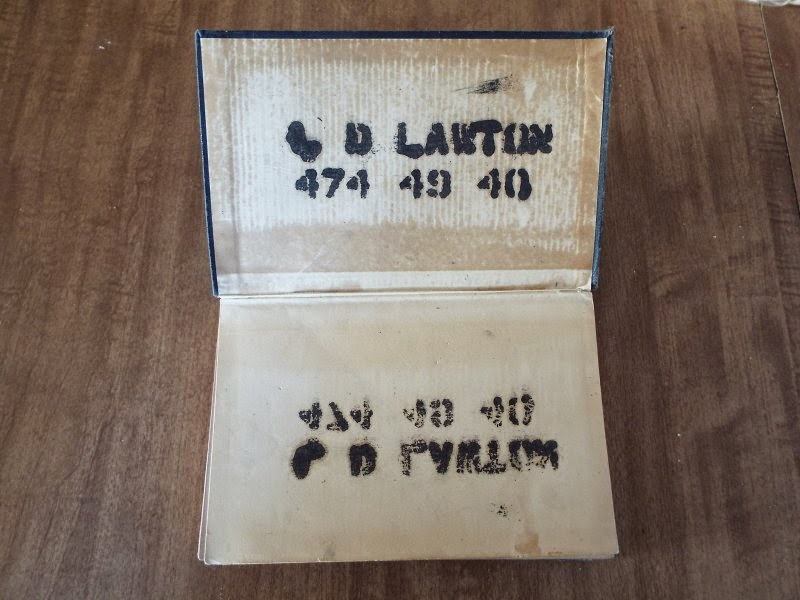 Our Company Commander was a first class petty officer named Hunter. Fifty of us were only a day or two in the Navy, while an additional six were attendees of the Recruit Preparatory Training (RPT) facility. Lacking formal education they couldn’t understand Navy training so upon entry they were given enough basic education to get along. As this was nearly sixty years ago, this old sailor may have forgotten a bit, but as I recall we all stood in lines as we were given a good physical examination, issued Navy clothing and necessary hygienic items, and haircuts, before marching back to our barracks #147 for a session of stenciling all our newly issued clothes and such. 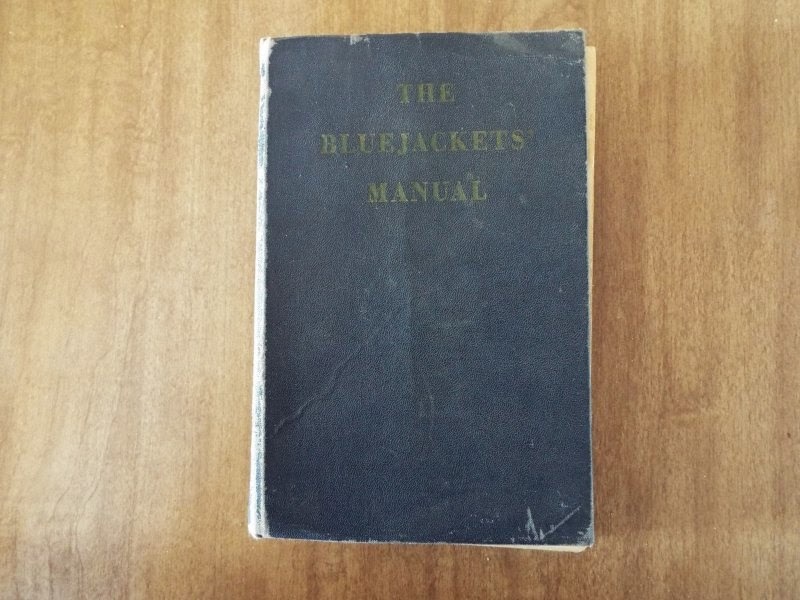 I yet have my issued copy (with stenciled interior) of The Bluejackets Manual. Touching on that haircut experience, I noted that the six sailors from RPT had longer hair due to their several week’s earlier entrance to boot camp. I reasoned that I had fairly short hair to start with, that it might not be noticed there was a seventh sailor with longer hair so I didn’t get in the haircut line. I was right, and no one noticed for about a week, but then someone did. I always thought it was one of the RPT guys that didn’t want competition in that department. At any rate, our Company Commander drew me aside and had me escorted for a haircut. Of course, this set me back a week or so behind everyone else, but I really didn’t care, I had only wanted to see if I could get away with it or not.